With the aluminum unibody design, the S7 Ultrabooks™ are exceptionally slim and light, yet durable enough to handle the rigors of everyday use. The 13.3-inch model offers up to 12 hours of battery life, while the 11.6-inch model can run for up to 9 hours, to ensure a full day of on-demand productivity and media consumption from a single charge. To make the best of the powerful performance components, Acer designed its innovative Acer Twin Air cooling system to produce efficient cooling and deliver the best thermal comfort. 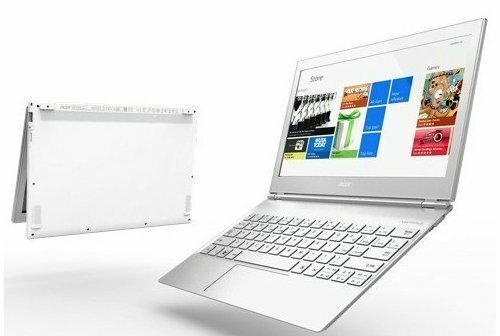 Acer's S7 Series also features a light-sensing keyboard, which automatically detects changes in lighting conditions and adjusts the keyboard backlight brightness. The new S7 range are singular ultra-mobile devices that blend performance, aesthetics and user-friendliness, giving modern day explorers the most complete and satisfying computing experience.